The Gemini VII 2390 Series Surface Area Analyzers by Particle & Surface Sciences rapidly and reliably produce accurate and repeatable surface area and porosity results. The Gemini VII 2390 Series Surface Area Analyzer retains the patented twin-tube design of the previous series of Gemini products. This design assures fast and accurate dosing of the adsorptive gas without pressure overshoot and also negates free-space errors introduced by thermal gradient variations or by initial mismeasurement of free space. The Gemini VII 2390 Surface Area Analyzer is available in three model options. The Gemini VII 2390a is suitable for rapid and accurate surface area determinations. It also provides standard methods for single-point and multipoint BET and Langmuir surface areas, total pore volume and micropore analysis by the t-method. The Gemini VII 2390p Surface Area Analyzer provides additional precision with the addition of a saturation pressure tube allowing the user to monitor the saturation pressure of the adsorptive on a continuous basis. The instrument is designed to provide a rapid measurement of the adsorption isotherm. 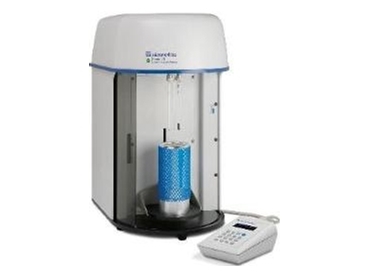 The Gemini VII 2390t Surface Area Analyzer has all the capability of the 2390p with the additional ability to perform a BJH or Dollimore-Heal pore size distribution using both adsorption and desorption isotherms of up to 1000 points. This instrument also features a saturation pressure tube as well as a larger Dewar and longer sample tubes for extended analysis. All Gemini VII models permit low to high surface area measurements without requiring exotic gases such as argon or krypton. Each model option can also be operated stand alone or connected to a computer running Micromeritics’ Gemini VII Windows software, greatly expanding data reduction and reporting capabilities. Micromeritics’ optional confirm software is also available which addresses the many requirements specified by 21 CFR Part 11 validation, security, audit trails and reporting. Small footprint, speed, accuracy, simplicity of use, reliability, and ruggedness make the Gemini VII 2390 Surface Area Analyzer a suitable tool for teaching, research, and quality control environments. The Gemini V Series is suitable for measuring the surface area and porosity of broad range of applications such as pharmaceuticals, ceramics, carbons, catalysts, paint and coatings, propellants, electronics, cosmetics, and aerospace materials. Particle & Surface Sciences also offer support solutions, including installation and service of all instruments.